The subscriber will offer, at public auction, at the Botetourt Springs, on Wednesday, the 18th day of December next, (if fair, if not, the next fair day thereafter,) all the personal and real estate of the late Mr. [Charles] Johnston. The personal estate consists of between 20 and 30 valuable Negroes, among them some first rate house servants, cooks, &c.--- a large stock of Horses, Hogs, Sheep, and Cattle of every description. Household and Kitchen Furniture, Plantation Utensils, Crop of Corn, Fodder, Oats, &c., &c.
At the same time and place, the Botetourt Springs will be publicly offered at auction. The buildings are spacious and in good order, equal to the comfortable accommodation of one hundred visitors. 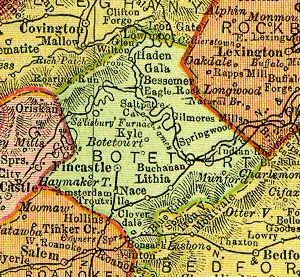 The plantation attached, containing about 500 acres of good quality, is of itself a valuable farm, and the surrounding neighborhood one of the wealthiest and most desirable in Virginia. The company at the Springs during the last two seasons has greatly increased, and no doubt is entertained by the subscriber, that, in the hands of an active and enterprising owner, this property would soon be among the most valuable in upper Virginia. Persons desirous of purchasing are invited to visit the subscriber before the sale, or to communicate with him by letter, directed to Cloverdale, Botetourt county. He would prefer making a private sale, but if not privately disposed of before, they will be offered publicly, as before stated. Will be opened also, a small tract of Land, lying about four miles from the springs, containing about 220 acres, mostly in woods. Terms will be accommodating and made known at the day of sale.